You'll be £19.99 closer to your next £10.00 credit when you purchase Wellington’s Hidden Heroes. What's this? The Duke of Wellington described the Battle of Waterloo as ‘the most desperate business I ever was in. I was never so near being beat’. The courage of British troops that day has been rightly praised ever since, but the fact that one-third of the forces which gave him his narrow victory were subjects, not of George III, but of the King of the Netherlands, has been almost completely ignored. This book seeks to correct a grave injustice through the study of Dutch sources – both primary and secondary – the majority of which have never been used by English-speaking historians. The Dutch-Belgians have been variously described as inexperienced, incompetent and cowardly, a rogue element in the otherwise disciplined Allied Army. It is only now being tentatively acknowledged that they alone saved Wellington from disaster at Quatre Bras. He had committed a strategic error in that, as Napoleon advanced, his own troops were scattered over a hundred kilometres of southern Belgium. Outnumbered three to one, the Netherlanders gave him time to concentrate his forces, and save Brussels from French occupation. At Waterloo itself, on at least three occasions when the fate of the battle ‘hung upon the cusp’ their engagement with the enemy aided British recovery. Their commander – the Prince of Orange – is viciously described as an arrogant fool, ‘a disaster waiting to happen’ and even a dangerous lunatic. According to the assessment of the Duke himself, he was a reliable and courageous subordinate. 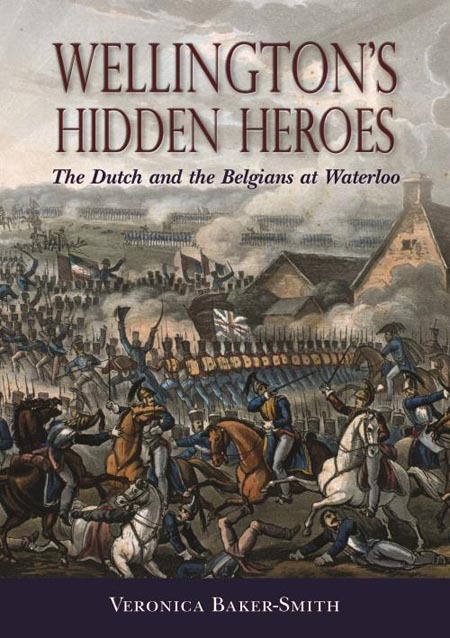 The Dutch material in this book reveals a new dimension for familiar events in the Campaign, and includes many unseen illustrations. For the first time, a full assessment is made of the challenge which Willem I faced as King of a country hastily cobbled together by the Congress of Vienna, and of his achievement in assembling, equipping and training thirty thousand men from scratch in eighteen months. This is a timely reassessment in the two hundredth anniversary year of the battle of Waterloo. The veneration which the Duke of Wellington justifiably enjoyed after the Waterloo Campaign should not be allowed to forgive his lifelong lack of acknowledgment of the debt he owed the Netherlanders. As he once said himself, ‘there should be glory enough for all’, and it is high time that they are allowed to claim their share. Veronica Baker-Smith lived in the Netherlands for seventeen years, and her work in the Dutch archives resulted in An Alien Patriot: the Life of Anna van Hannover, for the Thomas Browne Institute of the University of Leiden. She is also the author of Royal Discord – a study of the family of George II.